← Storms causing local residents to seek shelter. Volunteers needed! Mobile Food Truck returns soon!! Only 3 weeks until the Mobile Food Truck from the Houston Food Bank is returning to town. Mark your calendar now to help distribute food on Saturday, August 1st! You will be so happy you were a part of serving your neighbors. 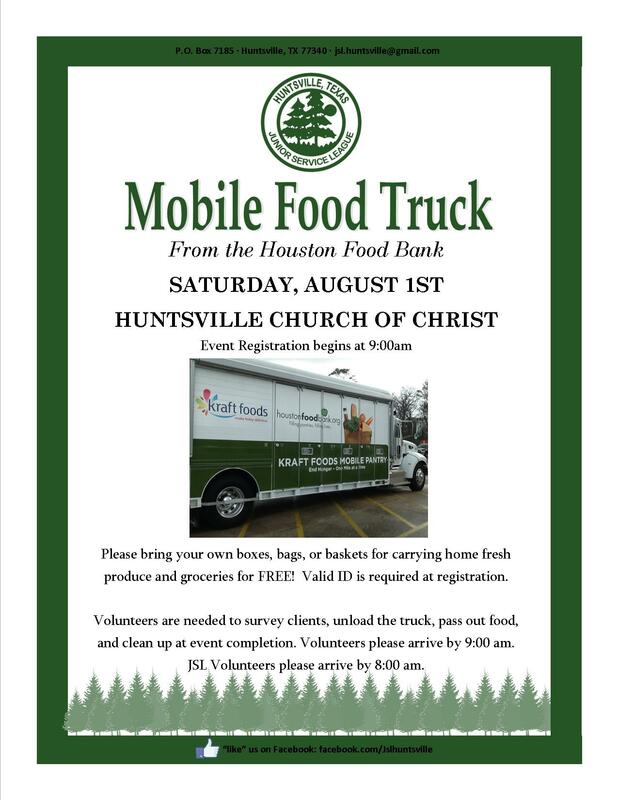 The Huntsville Junior Service League is teaming up with the Huntsville Church of Christ to bring much needed items to help start a new school year off on the right foot! HCOC is having their annual Back-to-School clothing give away and in conjunction, the food truck will be bringing fresh produce to distribute to all who attend. Come serve alongside community members to give back to those who are less fortunate. The food truck will arrive sometime after 9:00 and the food will be distributed as soon as we can unload the pallets. Volunteers for the food truck should arrive at 8:30.